Pregnancy Announcement - First Mothers Day - Chalkboard Style - Photoshop or Printable - FREE ultrasound picture addition. Announcement Welcome to Caytee Rose Designs we are an ALL DIGITAL shop. All Items bought will need to be printed or photoshopped into a picture. There are NO physical items shipped to you from this shop! We LOVE working with new clients and love new ideas! Don't be afraid to message us. ALL orders are 48-hour turn around. Please like our Facebook page for 15% off! Follow our Instagram for even more special giveaways and discounts! Welcome to Caytee Rose Designs we are an ALL DIGITAL shop. All Items bought will need to be printed or photoshopped into a picture. There are NO physical items shipped to you from this shop! Love working with Caytee! Such quick turn around and always love her designs! 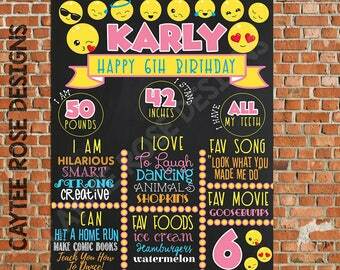 Have some fun and celebrate your birthday with our personalized adult birthday chalkboards! On sale now for 10% off!! Perfect for every QUEEN! You're never too old to have some fun! Video summary: Caytee Rose Designs even creates Video Montages for any occasion. Contact Caytee to get more information! 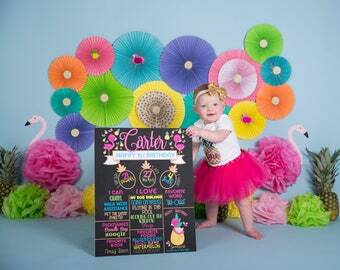 Caytee Rose Designs was recently featured in a local mom blog! I started my Etsy shop, Caytee Rose Designs in 2014, after the birth of my 4th child. Since I knew she would be my last child, I wanted a way where I could remember my last pregnancy. 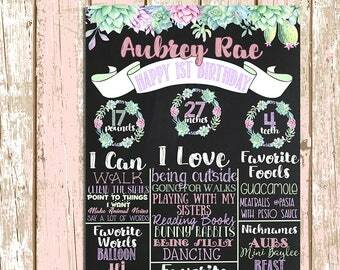 I searched Pinterest and of course, saw many beautiful hand-drawn pregnancy chalkboards. I knew my talents were more in graphic design then handwriting so I decided to create digital pregnancy chalkboards in Photoshop for myself, each week of my pregnancy. I shared them on my Facebook and all my friends and family loved them and suggested that I should try to sell them. Once my daughter was born I decided to put my 15+ years knowledge of photoshop and graphic design to use and open an Etsy shop to help other moms remember their pregnancy, the way I had. I wanted to make it simple for the excepting mother. 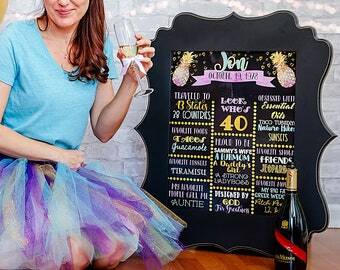 So, I created my service of digital chalkboards, where all the mother-to-be has to do is pose in front of any frame in her home for a picture, she then sends the picture to my Etsy shop and within 48 hours I photoshop a custom pregnancy board into her frame and send the picture back to her. Cutting out the hassle of printing and fitting it into a frame, we do all the work. I was so pleasantly surprised to find out this service was indeed in high demand and have worked with over 100 expecting mothers. 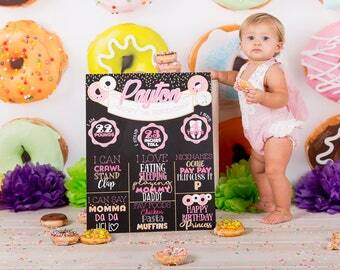 In 4 years, Caytee Rose Designs has grown into much more than pregnancy chalkboards, I also provide Child Birthday Boards, Adult Birthday Boards (perfect for those dirty thirty photoshoots), Pregnancy Announcement boards, Back to School Boards and Photo Editing. While my shop is certainly a blessing, I am sure every mom can relate to finding the time. Running an Etsy shop takes work, you always have to have new material and I promise every single client 48 hour turn around, no matter what is that you purchased. There are many nights where after running my 3 boys to 3 different baseball games and making sure my little girl got to her dance class, making sure all 4 are fed, bathed in bed, that I would stay up way past my bedtime and make sure every message was responded to, every client was happy and every listing looked perfect. But, for me, its worth every minute of it. Getting to work with a mother-to-be so closely for 9 months, on something as personal as a pregnancy is really an amazing thing. I have met some amazing, strong, beautiful women since I started my business. I love that my work can make a birthday party more beautiful, a photo shoot more fabulous, the first day of school more adorable and a pregnancy unforgettable. I am a stay at home to 3 crazy boys and 1 little princess! I am happily married to my high school sweetheart for 10 years. I've been doing graphic design for over 17 years and love making beautiful designs. The only reason I will give a refund would be if you mistakenly purchased an item, without realized exactly what it was. Once I've made a chalkboard for you, I can not refund the purchase price. I will not refund any montage jobs that have already been started. If you have any issues, please feel free to contact me and I will do my best to work with you. Must receive payment before you receive any images. If you have chosen a photoshopped chalkboard, please message me your image ASAP so I can get it back to you within 48 hours. All items in my shop are digital. There will be no physical items mailed to you. Most items in my shop have a 48-hour turn around and are either emailed to you or sent to you in Etsy Messages. All items are digital, you will not receive any physical item. The standard turn around time for every item in my shop is 48 hours. What size are the printable boards? 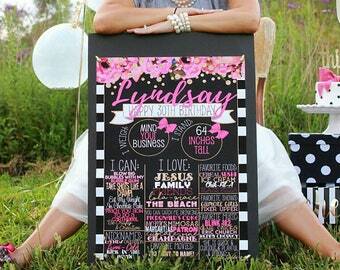 All boards have a standard size of 16x20. If you need a bigger board size, please feel free to contact me. How do I print my boards? You can place it in a frame or mount it to a foam board. Most photo labs will allow you to send your images to them online for printing or you can put your high-resolution JPEG onto a thumb drive and bring it into the store. I don't see the theme I want, Can I request a custom theme? Yes! 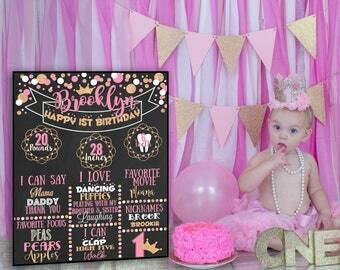 We LOVE making new birthday boards, with new themes. Just send us a message and we will do our best to make your idea come to life!